True, daily car commuting can be a nightmare with all those traffic jams, gas-tank refills, road blocks, other road hazards, and what not! Such commuting woes can definitely take a toll on your productivity, apart from causing extreme stress and frustration. Nevertheless, there are a few apps out there which can help you streamline your commute and save you a lot of time. Listed below are 4 Android apps that will help you stay sane while commuting. If you want a fun way to get up-to-date information on traffic and road alerts, nothing gets the job done better than Waze. With more than 30 million users over the globe, Waze is a gamified navigation app that helps you find the quickest way to get to your destination. It is a fun mapping and traffic app that enables users to help each other by reporting traffic conditions like road blocks, accidents, traffic cameras, speed traps, bottlenecks, and stalled cars. Users can also find cheap gas stations along their route, along with community-shared fuel prices. 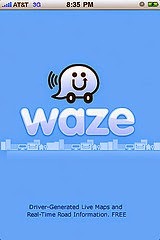 Waze is the ultimate way to contribute and benefit from 'common good' on the road, and to get involved in your local driver community – is there anything about this app not to love? If you commute by car daily, chances are that you're always on the look-out for gas stations selling fuel a tad cheaper than the regular gas stations, right? Well in that case, you might want to look towards GasBuddy for some assistance. GasBuddy is a brilliant app that helps users locate the nearest gas stations having the cheapest fuel prices. To get the app fired up, all you need to do is to enter your zip code or either use your phones GPS to nail your location, and the app will conveniently list out all the nearby fuel stations, sorted according to cheapest fuel prices. GasBuddy is essentially a community-based app, which means that even you can update the latest fuel prices in your locality in real-time for fellow users – how cool is that? Tired of spending hours and hours stuck up in traffic during your daily commute to work? Looking for an awesome way to fight speeding tickets? Want to avoid running into road blocks or accident spots? If yes, Trapster is the app you need! Trapster is a terrific app controlled by a worldwide community of over 20 million drivers working together to ensure your daily commute is smooth. Via the app, users can get alerts for road accidents, traffic accidents, speed traps, speed enforcement cameras, location of red lights, and more. It also has built-in audio-visual alerts that keep you updated on road hazards as and when they get reported. What's more, the app also has a nifty feature that allows you to confirm, update, or report speed limits wherever you go! No prizes for guessing what this awesome app does best – its helps you beat the traffic! Literally, Beat the Traffic is a fantastic app that gives you access to all the real-time traffic information you might need to make your commute stress-free and quick. Beat the Traffic quickly allows you to check real-time traffic conditions, road incidents, the quickest routes that you can take, and more. Furthermore, use the app to get estimated travel time, traffic cameras, weather, and traffic flow, all on your smart phone's screen. What can be better than getting to see traffic problems well ahead of time, and then deciding your route accordingly? Nothing. Today's featured writer, Nancy Baker, is a freelance blogger, who often writes for Stopp . She likes to practice yoga to stay healthy and fit. You can also follow her on Twitter @Nancy Baker.